Normally pictures of the front foundation border are avoided. This area qualifies as one of my least favorite views probably because the plantings do little to set off or relate to the house. They’re kind of a mess come to think of it, but believe it or not they’ve come a long way <click here to see>. 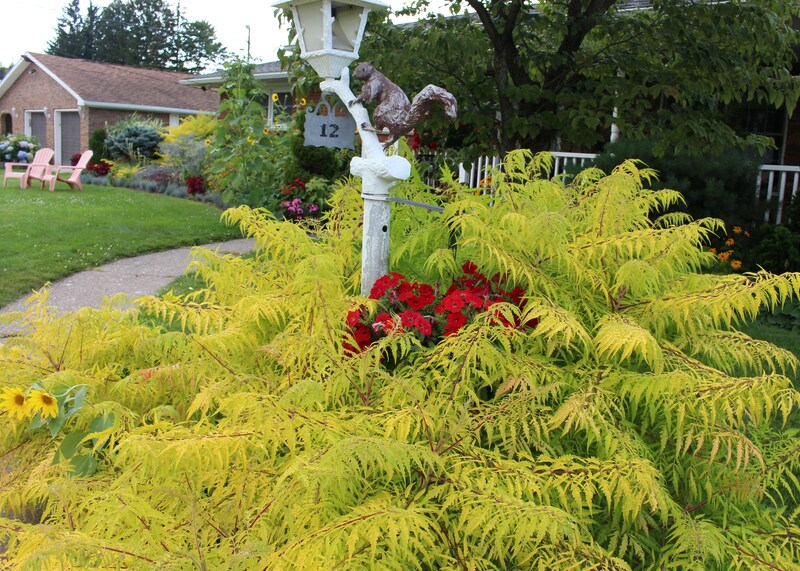 Our visit starts with a stroll up the front walk past the welcome squirrel and edging by the ‘Tiger Eyes’ cutleaf sumac, which threatens to engulf all visitors. Which is too much? The overwhelming yellow, the tacky lamp décor, or the too-red petunias? The right side of the house is fronted by the porch, and in front of the porch is a pretty generic planting of evergreens and hostas. They do a great job of being green and covering up the beds which house my favorite snowdrops and corydalis earlier in the year. Of course a rudbeckia would show up here as well. This is one of the completely perennial and later blooming R. fulgens types, and I make an effort each spring of ripping it out only to have a few stray shoots survive anyway. 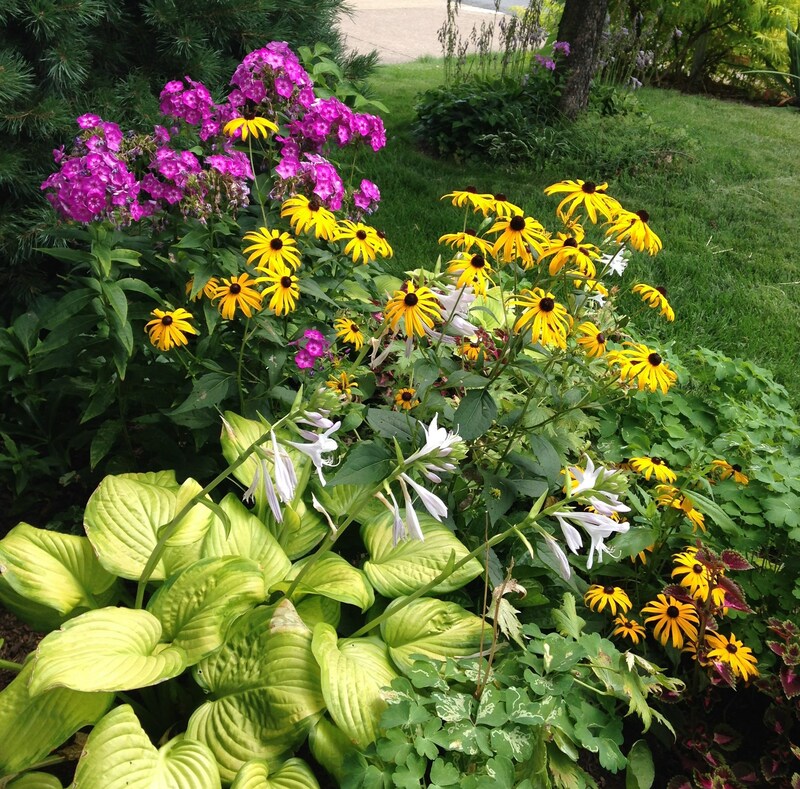 btw, The pink of the phlox ‘Laura’ with the gold of the rudbeckia is one of my least favorite color combos. The left side of the house is my problem bed. I tried ironing out a few of its problems earlier this year but it still makes me raise an eyebrow each time I pass. My first after-vacation task was to pull up all the massive crabgrass plants which were taking over, and while doing this I couldn’t help but wonder why I can’t show this same resolve against the inappropriately large sunflowers which sprout up each year (in my defense I did rip most out… but once they get past a certain size it just seems wrong to yank them). Weeding crabgrass in August. What gardener doesn’t know this story? If I could only get visitors to crawl around on their hands and knees I think the impression this bed makes would be infinitely improved. I like how the blue fescue is filling in along the edge, it goes well enough with everything and seems to be doing ok. I wish it would do better, but I haven’t yet cracked the fescue code on what really makes it clump up and fill in. For some reason peppers seemed like a good candidate for a foundation planting this year. Last summer I bought a single ‘Masquerade’ ornamental pepper and these are its seedlings. The purple fruits should go to yellow then orange then red as they mature, but a few plants are starting out yellow, and I don’t know what they have planned. My unknown biennial eryngium turned out to be a perennial and is back for another show this summer. If you can avoid the masses of wasps and bees the flowers attract it’s really a pleasant all summer cloud of blue-grey. The mix of colors at this end of the border almost looks tasteful if you ignore the sunflowers peeking in on the right. 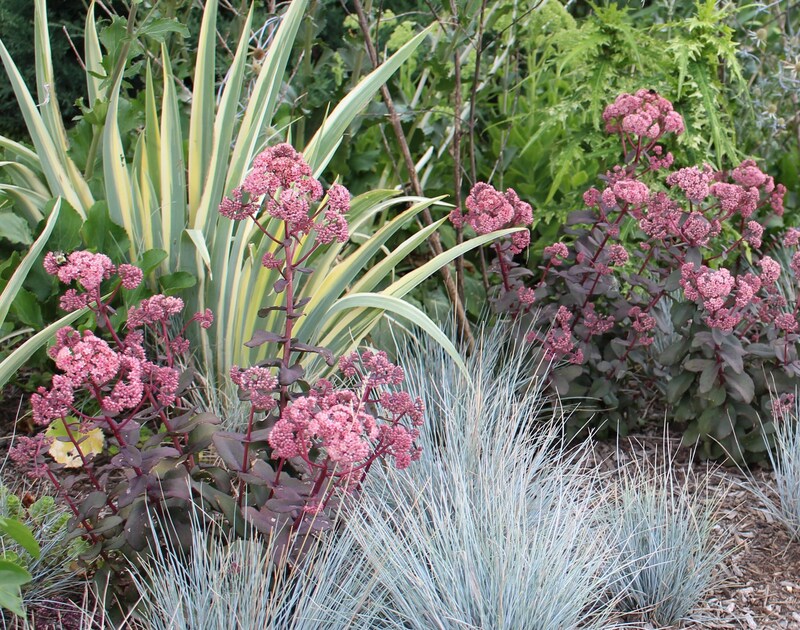 Most of the plantings here are haphazard and either work or fail by luck, but the pairing of the blue fescue and pinkish ‘bon bon’ sedum was intentional. I’m pleased with the contrast of the sedum coming up out of the fescue and it’s just what I was hoping for… as long as you overlook the sorta sparseness of the fescue. Sedum ‘bon bon’ with blue fescue and iris pallida aureo-variegata. 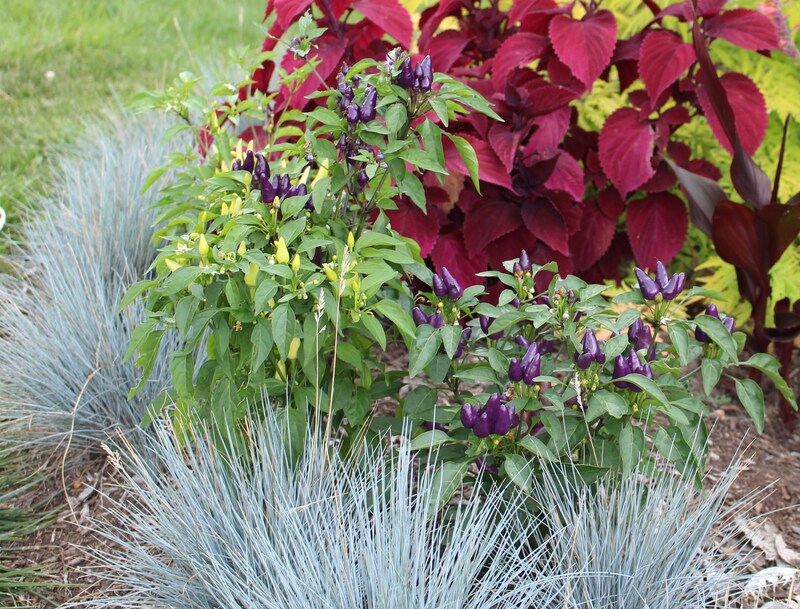 Variegated st Augustine grass, ‘Alabama sunset’ coleus, more sumac, and an up and coming cardoon seedling. 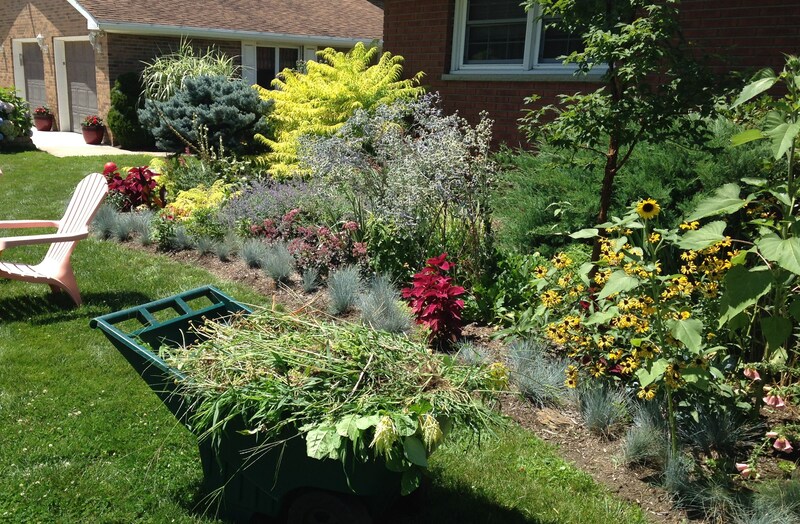 This entry was posted in annuals, garden design, perennials, summer, Uncategorized and tagged drought tolerant perennials, foundation plantings, mixed perennial border, plantings for a ranch, summer flowers. You have some really stunning combinations, I think you are being too hard on yourself! I have the same problem with the blue fescue, I planted it years ago and it just stays the same size, never seems to increase, do I have to dig it up and make it into a dozen tiny plants? 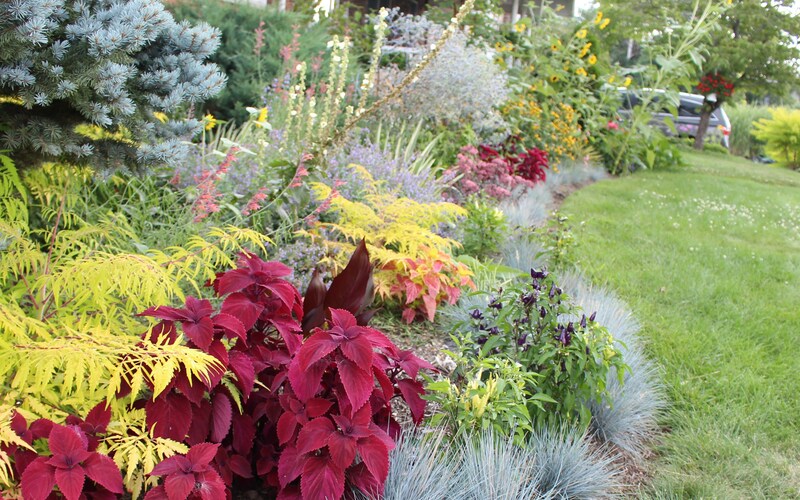 Your Coleus look stunning with the Sumac and fescue, super combination! I tend to compare my garden to others and see the faults in what could have been… not that I don’t enjoy it, but like everyone I’m always planning for next year! I love all the bright sumac sprouts now, but they grow every minute my back is turned! I think you’ve put together some great combinations. Coleus is on my list for pots on the terrace next year, I love the rich colours. I think your Fesctuca just doesn’t like your soil, mine loves my free draining soil and no water, so much so that it grows huge and needs dividing all the time. It used to be my signature plant in the garden but I’ve actually removed several as the local cats seems to think its soft texture makes the perfect toilet! I think you’ll enjoy the coleus. Named varieties through cuttings are far superior in my opinion than seed strains, but even seeds will produce a nice plant. I’m also surprised at how well they tolerate drought, they surely don’t enjoy it, but bounce back as soon as they get a little water. I like the sumac and the lamp with the squirrel, and I think the problem is not that your petunia is too red, but rather that there is not enough of it! It looks a bit lost in there! I can’t tell; is it hanging from a bracket off the lamp post? Is there any way you can raise it up a bit? I know you feel yellow is not “in”, but I like the pops of brightness the stray rudbeckias give your plantings. To me, yellow adds balance, makes the color wheel complete. I don’t mind it with those bright phlox, but what doesn’t work there for me is the phlox, hosta blooms, and dark coleus in front. The phlox is just too bright for that combo, in my opinion. I like the Fescue border, and its juxtaposition with the sedum. That is a nice combination. I like the peppers, too–interest and whimsy! I bet those yellow ones go red eventually. The coleus and Sumac suckers look really nice together too. Overall, I think your foundation plantations are subtle and restful to the eyes (except for the phlox! ), yet really interesting at the same time. I wouldn’t have been able to yank the sunflowers, either! Again, more interest! I’ll have to give the phlox some more thought. It went in there before the light hosta and rudbeckia showed up, and I was leaning more towards blues and purples at that point. As you can see, color is not my strongpoint, and I’m even worse at actually sticking to a theme. If you get down here I’ll want to hear your first impressions, I look at it way too much to have an unbiased opinion! Have you noticed I love the sumac suckers too? It’s probably a bad idea but I let them go and enjoy them until they get too big for the spot. Of course by that time they’re coming up in another spot even further away and I’ll be paying a price for that! Lovely combinations. 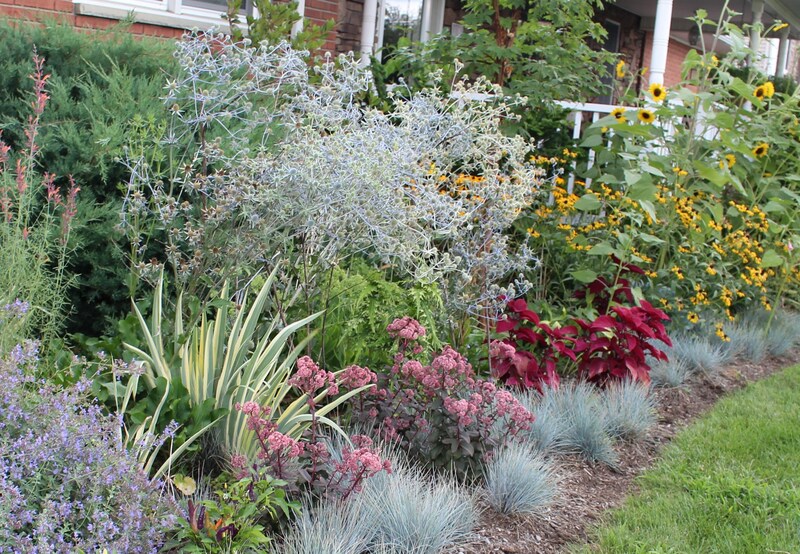 I love the Sedums with the blue Fescue. You must be very pleased. It doesn’ t look haphazard to me. I should take credit for all of it. I love all the foliage. What on earth is crab grass? Crabgrass is the plant kingdom’s equivalent of the mosquito: Arrives in summer, invades everywhere, and makes your life miserable. The only thing I can think of that’s worse is poison ivy (Toxicodenron radicans) which you don’t have in the UK either. I’ ve heard of poison ivy but crab grass is a new one for me. Well. The lamppost came with the house. I’m sure it was all the rage in the 50’s along with a concrete donkey pulling a wagon planter and a concrete african-american stableboy holding a lantern. Oh and a vigin Mary grotto, had one at the last house. I’m starting to like the squirrel, I have no plans for letting it go yet it may need a paint touch-up! A favorite was always the back view of the boy who was apparently peeing. The shrubbery. It’s a wooden cutout too, one that looks like the back view of a boy ‘doing something’ with his pants around his ankles…. Thanks! I feel like each year it’s an improvement and someday I’ll be completely thrilled! I like your entry very much. It has a lot of interest. 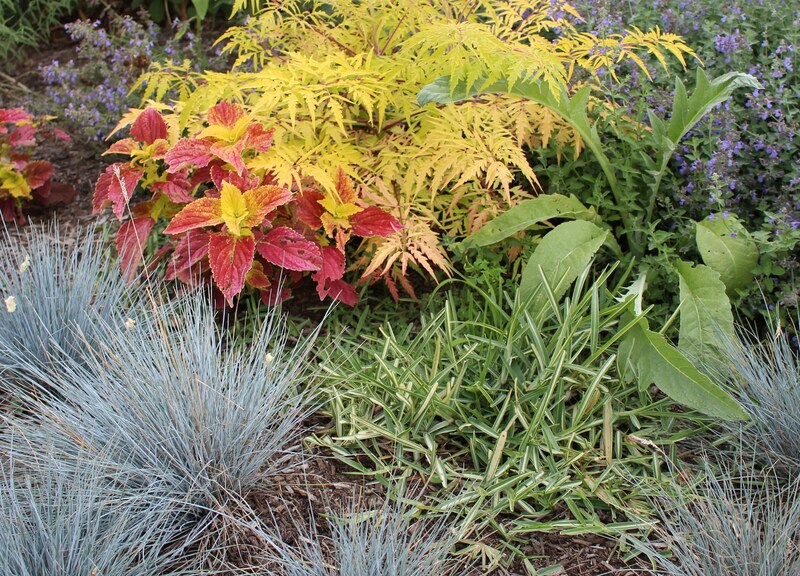 My favorite combo is, “Sedum ‘bon bon’ with blue fescue and iris pallida aureo-variegata.” Love the vignette. Thanks, I love that combo as well. I need to keep a watch so that it doesn’t get swamped as the season goes on and returns next year even better! We’ve been redoing our driveway and entrance after talking about it for years, so I sympathize with front garden issues. That said, I would kill for that Eryngium. Gorgeous. The eryngium is from seed and carefree, it is a great plant! Let me know if you want to try some. Great colors — love the chartreuse with the reds. For the most part, you are rockin’ it. I think your blue fescue looks great, which, being translated, means better than mine. Frances of Fairegarden told me it needs to be divided frequently to look good. Being a clumper and not a runner, it’s never going to knit together, I don’t think. About that phlox–it would look better if it were more purple or more red, or if the rudbeckia was a more pure yellow. Because that phlox actually goes well with everything except the black-eyed Susan. Well, I am probably not telling you anything you didn’t already know. Just thinking out loud. Maybe if you added some white to the mix? And excellent use of those sumac suckers. -but I think I’ll make another attempt at yanking the yellow. The hosta could probably go elsewhere as well, but shade is in short supply around here…. well let me rephrase that, shade that isn’t in the stranglehold of red maple roots. Or I could let some sumac in here as well to choke everything out! I’m going to try and be nicer to the fescue. Maybe a feed will cheer it up, but if it needs dividing each year I might have to find something else.